Smoked 1 March 2012. In humidor since 5 March 2010; box code unknown but obviously 2009 vintage. Every single one of these I’ve smoked so far has been disappointing and irritatingly, this was no exception. Whilst there were some flavours noticeable, it wasn’t a particularly pleasant experience. Considering I’ve had this in my humidor for nigh on two years now, I was expecting them to have settled slightly. When something heavyweight like a Bolivar Royal Corona becomes tolerable (some may say beautiful!) to smoke pretty quickly, I kind of wonder why these are so impenetrable to my tastebuds. Now you may be able to gather that I don’t get as much chance to smoke cigars as I used to, solely from the frequency of my posting on here. So it really annoys me when my opportunities are wasted with crap like this. It will be at least a year before I try one of these again! I saw a trailer for this 2010 film recently and the all-star cast (Bruce Willis, Helen Mirren, John Malkovich and Morgan Freeman), and ludicrous sense of humour really appealed to me. RED is an acronym for ‘Retired: Extremely Dangerous’. One clip in particular really tickled my fancy, and it’s when Bruce Willis skids around a corner and simultaneously gets out of the car whilst firing a gun at somebody chasing him. Absolutely ridiculous, but it knows it. The other characters are highly amusing, particularly John Malkovich’s paranoid survivalist. This film is firmly tongue-in-cheek but the high calibre acting really pulls it off. I’m not sure whether this was originally a comic or graphic novel, but it certainly has that feel about it. It doesn’t require much attention and is far less cerebral than the usual kind of thing I like to watch, but when you’re in the mood to just sit back and be entertained, it certainly fits the bill. Thumbs up from me for this one. I’d certainly watch it again! On Friday I went out for dinner and snails were on the menu. Now I’ve heard about ‘escargot’ on French menus but never seen Lamache All’aglio (snails in garlic butter) on an Italian menu before. I had all kinds of preconceptions about what to expect from the experience of eating snails and pretty much none of them were positive. Having been wrong about this kind of thing in the past, I thought I’d give them a go. The reality was so far from what I imagined that I was astounded! I was assuming they were going to be slimey or sludgey inside and not particularly tasty. I received six on a plate with some sprung tongs and a tiny fork, and they were still in their shell with some garlic and herb butter plugging the end. Now I love garlic but do have an issue with the texture of certain foods which was my main fear about the snails. Enough rambling though. They were excellent, and I wouldn’t hesitate to have them again if I saw them on the menu. They were similar in texture to seafood, but obviously without the fishy hint. Meaty, but not fibrous like steak or pork. I think the nearest meat they reminded me of were scallops. I’d definitely recommend giving them ago if you see them available as they don’t deserve the stigma that seems to surround them. Looking further into this, as I quite fancy cooking some myself, the ones I ate were probably Helix pomatia. Bizarrely, these appear to be a protected species in England but conveniently for me, not in Wales. I can only assume French restaurants in England do not serve this species. The common garden snail Helix aspersa also appears to be edible, so I may well be giving them a go too. Looking around the web, information varies on which is the most popular or tasty, so in the name of science I’m going to give both a go. I think they hibernate in the winter so it won’t be just yet. From what I can gather you just need to starve them for a few days, or feed them something safe for humans (carrot has been suggested) to flush through any potential toxins. I’ve looked at quite a few sources about eating snails and they seem to vary on the preparation techniques, so I assume I probably won’t go too wrong with whichever method I choose. Check back for news on how it went! I’d wanted to watch this film for a while as one of the characters (‘Carol’) looks like a cat I know. Strange name for a male character to my mind, but he’s the one on the left of the poster shown on the Wikipedia entry. Being adapted from a children’s book, I thought it was going to be a light-hearted story, but I got quite emotional by the end of it. The film centres around Max who seems to be quite the angry little chap. It appeared to me that his older sister annoys him and his father isn’t around. His mother seems to have a new boyfriend that Max seems envious of, so he tries to throw his weight around to get her attention. This ends up with a bit of a scene where he runs off and ends up sailing to a magical world where these monsters live. They intend to eat him but he manages to persuade them he’s a king, so he becomes their king. Without spoiling too much more of the story, one of the monsters appears to be upset about one of the other monsters leaving and takes it out on everyone and everything else around him. The others have to pussyfoot around him and this obviously doesn’t fix anything. It seems to be a metaphor for Max’s life i.e. someone he loves leaves him and that he can’t control this upsets him, so he has his tantrums. It did leave me wondering if this was how the original book was, or if this is an interpretation that turns it into a fable to help children understand complicated adult issues like divorce. It was an odd film. I don’t know whether it’s because I was expecting Carol to be spelt Karel, but it had an Eastern European or Scandinavian feel about it. The music seemed to reinforce this in my head. Now that the second series of Sherlock (if you could call three episodes that!) has finished on BBC, I’ve been missing something ‘clever’ to get my brain into. While I enjoy programs like CSI and Dexter they don’t really get my mind going in the way I want it to. I caught the last episode of series two of Luther when it was on TV and really enjoyed it but never got round to investigating the program further. Last night, I did so! I’ll try not to give any spoilers away in case you haven’t seen it. It opened with a little insight into the eponymous hero’s mindset, perhaps explaining his idiosyncratic behaviour and hinting at his analytical skills before moving to the present day. We move to a murder scene where Luther feels “something isn’t right” and while this isn’t expanded upon immediately, we soon get the nod that he’s correct. The show doesn’t just revolve around Luther’s work, mainly because his obsession with his job floods into his personal life. We see him with his wife and while marital turbulence is a common theme in TV detective shows, this doesn’t feel like it’s been done lazily. I’m really looking forward to watching the next episode, and may well talk to you about it here! Here’s what I’ve smoked since I last posted. Por Larranaga Petit Corona smoked 17 September 2011. Box code EMA OCT 07; in humidor since 28 November 2009. I’d previously taken this out and punched it, given it a test draw and decided it was too tight to smoke so put it back in the humidor. Not really sure when I’d done that but by now it had softened enough so the draw was spot on. PLPC are a reasonably cheap cigar so they are never going to win any contests for looks, but the construction was pretty good on this one. This was a strange mix of flavours; normally these go one of two ways. Milky bar, or bitter almond. This actually appeared to be right in the middle, which either means the bitter almond ones (which I’m not so keen on) are just in the sick period and I’ve been wasting them (! ), or there are two distinct kinds of PLPC. I’ve read it suggested that nobody thought there was any caramel aspect until Min Ron Nee did. I don’t know, but I’ve certainly experienced two flavour profiles. Cuaba Divino smoked 18 September 2011. Box code unknown as it was bought as a single; in humidor since 28 November 2009. I’ve not had much luck with these in the past, always finding them to be a bit rough and not to my taste. The figurado construction has been mentioned as occasionally causing draw problems but there was no issue here. The wrapper on one side needed a little touch-up; I had let it burn for quite some time in the hope it would correct itself but no such luck. Didn’t really enjoy this so ended up tossing it early as it didn’t improve. I don’t think it was too young seeing how long I’d had it for. I should try some other Cuabas though as these are the only ones I’ve tried. Smoked 26th August 2011. Box code GAS JUN 08; in humidor since 6 October 2009. 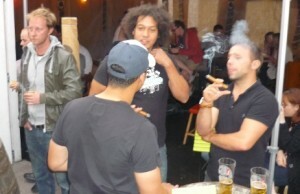 Gwdihw, one of the nicest live music venues I’ve been to, hosted what I believe to be Cardiff’s first Cuban cigar tasting event on the 23 August 2011. For those who don’t know, gwdihw (pronounced goody-hoo) is the somewhat onomatopoeic Welsh word for owl. I’m led to believe this is specifically South Wales dialect. Partagas Serie P No. 2 (box code TEB ABR 08; in humidor since 2 April 2009) on 20 August 2011. I’ve not had one of these for some time and it was pretty enjoyable. Lovely to the touch, perfect draw and the burn was spot on. Flavours weren’t as spectacular as I’ve had from some examples of the P2 but I wasn’t really concentrating on it. Rafael González Petit Corona (box code SEM NOV 08; in humidor since 28 June 2010) on 21 August 2011. I’ve found these variable up until now and this was bland and harsh. The expected flavour profile was present but seemed heavily masked. I’m probably just going to try and leave these alone for another year… Let’s see if it actually happens! Bolivar Belicoso Fino (bought as a single so age unknown; my records seem to claim I’ve had this in my humi since 23 September 2009 though I’m sure I’ve bought another since then) later on the 21 August 2011. This was disappointing, considering how much I normally love all things Bolivar. I was at a barbecue and had had a couple of burgers and a couple of cans of Stella Artois, which probably weren’t the greatest accompaniment! It started out OK but just got too heavy. I suspect I was smoking it a little too fast just so I could go indoors as it was starting to get cold. A pity.